This delicate 14k yellow gold flat herringbone chain necklace is both feminine and classic. It is about 4.84mm wide (about 3/16th"), 19.5" long and marked Italy and 14k on the clasp. This necklace weighs 10.6 grams. 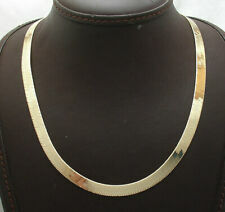 14K Gold 20" Herringbone Chain Necklace, box clasp, 14.8g NOT scrap, nice cond. Gently pre-owned, no kinks. The box clasp has a safety hook. It is stamped Italy 14K. It weighs 14.8 grams and has a nice weight in the hand. Mission: The Assistance League of Bellingham is an all-volunteer-powered nonprofit organization in Whatcom County, Washington State. Metal: Yellow GoldLength: 20 - 21.99"
14K YELLOW GOLD HERRINGBONE NECKLACE CHAIN. STAMPED 14K AND ITALY ON NECKLACE. Width . The width increases as getting closer to the middle of the Necklace, the width decreases as getting closer to clasp. This Necklace is in Great Condition with no Kinks or Repairs. Weight: 27g. Width: 8mm. Markings: "14kt" "Italy" "B&M". Country of Manufacture: Italy. It has a total weight of 7.9 grams and it's in excellent condition. 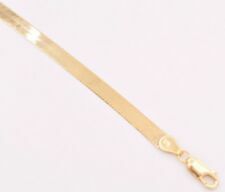 This 20” long 14k yellow gold chain is 3.3mm wide and in excellent condition. It weighs 6.3 grams and closes with a lobster claw clasp. It is marked 14k on the clasp and ends as well as Aurafin4 and Italy. Ending Apr 28 at 5:02PM PDT3d 23hMetal: Yellow GoldStyle: ChainLength: 20 - 21.99"
THIS FABULOUS PIECE WOULD MAKE A GREAT GIFT OR ADDITION TO ANY COLLECTION. WEIGHT:4.6 Gram Total. 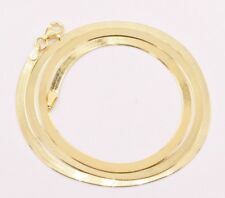 SIZE: 20" Around Inside When Clasped - 4mm Wide. 14k Solid Yellow Gold High Polished Herringbone 16 inch Princess Necklace USED!! 14k Solid Yellow Gold Necklace/Chain. Previously worn/NOT NEW - 14KT SOLID GOLD CHAIN ! Chain IS USED as noted in title/subject. Chain IS USED! Chain has "waves" in two or three areas/spots and Still Lays Flat as shown in my pictures! 16", 4.14 grams. Not scrap. 14k gold necklace in great condition. Ending Friday at 7:29PM PDT2d 1hMetal: Yellow GoldStyle: ChainLength: 16 - 17.99"
VINTAGE 14K GOLD ITALIAN HERRINGBONE NECKLACE 18" CHAIN 1.2 GRAMS estate find. Condition is Pre-owned. Shipped with USPS First Class Package. 14K Yellow Gold Italian Herringbone Necklace (17 7/8") 5.8 Grams NICE.14kt Italy with makers mark. Condition is Pre-owned. Shipped with USPS First Class Package.NOT SCRAP.Tested using a Niton DXL XRF Analyzer. 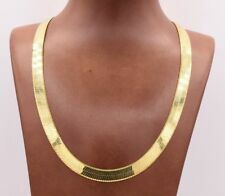 For sale is this pre owned new 14K gold herringbone necklace. The links are solid gold all the way through and are strong. This chain utilizes a very nice lobster clasp which is the safest design and least likely to fail. Marked "14K" "Italy" "Milor". Lobster clasp. Good condition. Length / Size / Width: 18", 3mm. Type: necklace. Flaws: Necklace has 2 imperfections on end opposite clasp: 1 right next to hook and the other 1.5" from hook (photos 7-10). Note that the actual color of the item may vary slightly from what you see on your computer or phone, due to differing monitor resolutions and/or light sources. 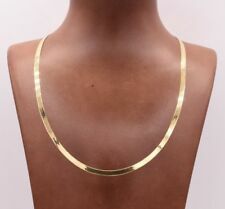 14k gold necklace 18" long x 1.38mm wide. Condition is Pre-owned but never worn, Herringbone style with a design running through the center. This necklace would make a beautiful mother's day gift. Tag is stamped 14k and Italy. Shipped with USPS First Class Package. Silmar 14K Solid Yellow Gold Tapered 7mm Quilted Herringbone Chain Necklace 17"
14k Solid Yellow Gold Italian Herringbone Diamond Cut 18.5" Necklace. Condition is Pre-owned. Shipped with USPS First Class Package to US only. No international orders. 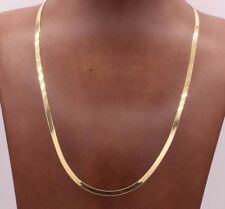 Unisex 18.5" Italian Gold Chain...Herringbone links and has a diamond cut pattern across both sides of the chain. 2mm in width...this necklace has no kinks and is in very nice condition. Approximately 3.7 grams. Its hard to see in the pictures, looks much more beautiful and bright in person. Thanks for looking. Check out my other items. Note: it is not smooth but textured, like a wheat look. Marked 14k gold, made Italy. This thin flat necklace has a gorgeous shine like a silky gold ribbon. DARK PARTS ON THE CHAIN ARE REFLECTIONS BECAUSE OF ITS HIGH SHINE. It is a solid chain, not hollow. 14k Solid Yellow Gold Herringbone Necklace 16" 3mm. 14k Gold Braided Herringbone Necklace 16” 5mm 15.1 Grams. Condition is Pre-owned. This necklace is absolutely beautiful. Very sturdy clasp. Vintage Unique Herringbone Necklace 20” Long, Stamped 14k, Solid Yellow Gold Chain 8.4 Grams. Its in very good condition. Free shipping with USPS priority Package. 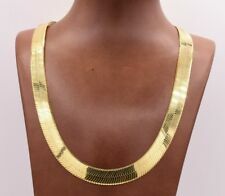 14k Yellow Gold Heavy 31g Thick Herringbone Link Chain Collar Necklace 15.5"
Closure: Box Tab Insert with Safety Clasp. Markings: "14k". Item #01034. For your consideration is a beautiful 20”, 5mm wide 14K solid gold Milor herringbone necklace. Made in Italy. The necklace is previously owned and is in excellent condition. Features Florentine texture on one side and the other side is classic herringbone pattern! 14K Solid Gold Florentine Herringbone-Link Necklace Chain. Stamped ‘14Kt’ and ‘ITALY’ on clasp, stamped ‘14KT’ and ‘ITALY’ on chain ends also. 14k Italy Yellow GOLD Herringbone 24” Necklace , Wt. 22 Gram. Condition is Pre-owned. Shipped with USPS First Class Package. Lobster claw clasp, smooth flat, no twisting. BEAUTIFUL SOLID 14K YELLOW GOLD HERRINGBONE CHAIN BRACELET. Up for sale is a beautiful solid 14k yellow gold herringbone chain bracelet. Material : 14K yellow gold. Maker's/ Identifying Marks :585 Italy. Spring ring clasp. marked 14kt and Italy on end and clasp. 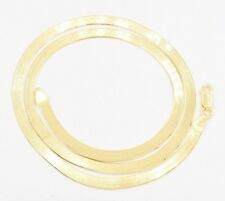 Ending Apr 28 at 10:49PM PDT4d 5hMetal: Yellow GoldStyle: ChainLength: 16 - 17.99"